The City of Hoboken will host the Hoboken Huddle at Pier A Park on the Hoboken waterfront the week of January 28 to February 2 leading up to Super Bowl XLVIII. 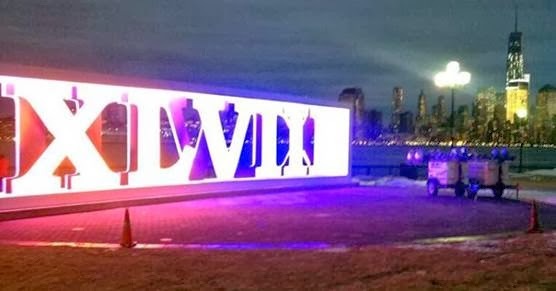 The Hoboken Huddle will feature a 12 foot tall illuminated sculpture of the Roman numerals “XLVIII” overlooking the Manhattan skyline. In partnership with the US Curling Association, the Hoboken Huddle will also feature 3 lanes of curling which will be free and open to the public each day from 10am to 10pm. Vendors will include Pizza Vita, Law Coffee, and the official Super Bowl XLVIII Fan Store which will be open daily at the gazebo at the end of Pier A from 10am to 10pm. No streets will be closed in Hoboken. The only street closure in Jersey City is 6th Street from Washington Boulevard to Marin Boulevard. The Hoboken Police Department will be enacting a zero tolerance policy on drinking alcoholic beverages in public, public intoxication, public urination, parking and traffic violations, unruly house parties, pop up parties, and unlicensed vendors. For those visiting the Hoboken Huddle on Pier A, all bags will be subject to inspection. Anyone who observes suspicious activity is asked to report it to the Hoboken Police Department at 201-420-2100. By Friday evening, the taxi stand will be temporarily relocated to the west side of Hudson Street between Observer Highway and Hudson Place.